Plumbing Contractors, FishHawk, FL | A Step Above Plumbing Inc. Plumbing Contractors, FishHawk, FL | A Step Above Plumbing Inc. Selecting the right plumbing contractors for your particular job in FishHawk, FL can be determined by a few important factors. What is the experience of the plumbing contractors in question? While similar in essential function, commercial and industrial plumbing services vary according to the type of business and need. In addition, residential plumbing has its own set of rules and regulations. 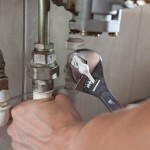 Select those plumbing contractors who have more experience in the type of job that you need done. What are the professional and state accreditations of the group? Do they operate on a single state license, or are there multiple licenses representing multiple highly skilled plumbers? Look at what business and professional organizations they are members of, and how those groups determine membership. What do those who have worked with this business before have to say? There are many sites where people can rate businesses and where advertisements can put those needing professional plumbing services in touch with those service providers. Word-of-mouth is another highly sought-after way for businesses to reach potential clients, and the word of someone in your social circle recommending a particular business often weighs more than any number of ads or online recommendations. For all your plumbing needs in FishHawk, Florida and beyond, let our team at A Step Above Plumbing show you how we live up to our name.